Aspects of Japanese daily life like prosperity, love, happiness and fertility came to Havana through the Traditional Puppet Theater Hachioji Kuruma Ningyo, which has been declared an Intangible Folk Cultural Property by the Government of Japan (1996). 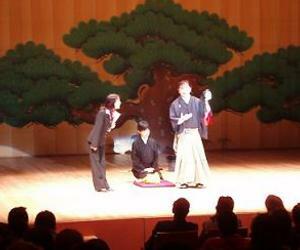 From a small seat, equipped with three wheels for easy movement on stage, the fifth heir of the Nishikawa family, the major booster of this variant of puppet theater, demonstrated the skills learned since he was 12 years old. Most important to maintain this tradition, which has been transmitted from generation to generation for 150 years, is to learn from teachers, the company president, Koryu Nishikawa, told Prensa Latina. In order to achieve this goal, the company has created a space in which a small group of people learn the difficult technique to maneuver not only the puppets, but the moods of each character, the environment on stage and the dramatic tension of the play. In order to be a good puppeteer, you have to enrich the characters, which involves the acquisition of knowledge about music and theater, said Nishikawa, for whom one of the most difficult and important aspects in learning this traditional performing art is to express the feelings through the dolls. After performing in Havana and in the western province of Matanzas, as part of the 10th International Puppet Festival, these renowned exponents of traditional Japanese art will tour Costa Rica and Canada to close their international tour of 40 countries.